Here at Palaeos, we point out right from the start that we are not authorities in the subjects covered, and anyone reading this site should approach its statements with all the caution of a serious burn victim re-potting cacti. Sometimes, though, a particularly abstruse topic is broached which reminds us to remind you of this rule. This is one of those times. The echinoderm stem is a repository for what are patently some of the most bizarre organisms ever to clutter the sea-bed. If, indeed, they are stem echinoderms at all. They may be derived crown echinoderms, or stem chordates, or organisms with no real connection to the echinoderms at all. Interpretations of these fossils are so varied and so divergent that one could be forgiven for failing to realize that they referred to the same animals. In the case of the Stylophora, researchers can't even agree as to which end is anterior and which is posterior. As a result, this section is a pastiche. With so many competing theories available, I have picked and chosen as seems appropriate (or as my whim takes me), and in the process I have quite likely constructed something which no researcher has supported, and to which no-one who has actually examined the fossils in question would give the time of day. My advice is to stop reading. Go straight to the bibliography, and get your information direct from the primary literature. You'll be better off. For those who have chosen to ignore my advice, a few notes will be given on terminology. In light of the highly debatable nature of the echinoderm stem, I have decided to restrict the name "Echinodermata" to the crown group only, allowing me to be more explicit about the origins of characters leading towards the modern body plan. This differs from the definition (often not explicitly stated) used in many publications. Probably the majority (including the Treatise on Invertebrate Paleontology) identify Echinodermata by the origin of the stereom. the calcite skeleton with an ultrastructure apparently unique to this clade. However, Jefferies (e.g. 1986) and his supporters, who place the Stylophora as the stem group of chordates, would see the stereom as plesiomorphic for a much larger clade. If defined by the stereom, Echinodermata would then include Chordata. Another alternative is defining Echinodermata by the origin of pentaradial symmetry. However, this character is often widely altered in both modern and fossil groups of echinoderms. Also, the 2-1-2 system of ambulacra in edrioasteroids demonstrates that pentamery and pentaradial symmetry did not necessarily arise simultaneously. Image: Carneyella, an edrioasteroid, from the College of Wooster, Department of Geology. We are particularly encouraged by studies like Furlong & Holland (2002) who re-analyzed prior sequence work with sophisticated Bayesian techniques, and obtained the same result with a great variety of individual sequences. See also Winchell et al. (2002) (same results, concatenating different sequences). Sequence phylogenies are still hit-and-miss; but the new fossils make it much easier to assess which have hit and which have missed. ATW051025. Arkarua adami is a small disc-shaped fossil, about 3 to 10 mm across, known from the Ediacaran of the Flinders Ranges in Australia (UCMP). All known examples are external moulds with a five-lobed central region that led to its identification as the earliest echinoderm. However, Arkarua lacks a stereom or any sign of a water-vascular system. Arkarua's position as ancestral echinoderm has been widely accepted. The problem is that a number of other echinoderm stem groups (homalozoans and Helicoplacoidea) that appear to predate the origin of pentaradiality, but possess a stereom. As pointed out by Mooi 2001), this paradox has persisted because the organisms in question have rarely been compared. Those analyses that included Arkarua generally omitted the non-pentaradial taxa, and vice versa. There are two possible options if Arkarua is a stem echinoderm: (1) Arkarua is more crownward than the non-pentaradial taxa, and either the stereom and water-vascular system evolved independently on a number of occasions (very unlikely, as it would require the repeated appearance of an ultrastructure and a complex organ system that have not been recorded from any other clade) or Arkarua secondarily lost the stereom and water-vascular system (also unlikely, as it would require the complete absence of preservation of any contemporary forms retaining the stereom) (2) The non-pentaradial forms are secondarily derived from pentaradial ancestors. This latter is not impossible. Mooi (2001) suggests that unusual taxa are often placed too far down in trees by the difficulty of recognizing synapomorphies with less derived taxa. Compare, for instance, the recent transfer of Microsporidia from their originally basal position in the eukaryote tree to a much higher one within the Fungi. 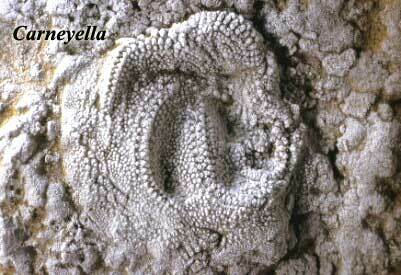 And some recent cladistic analyses have placed homalozoans within the echinoderm crown as derived pelmatozoans. Unfortunately any cladistic analysis is only as good as the characters it uses and the analyses in question were based on anatomical interpretations different from those favored here. The recently discovered Vetulocystidae, which lack a stereom but have a comparable organization to Stylophora, appear to support a basal position for at least some non-pentaradial taxa. The more likely explanation is that Arkarua's pentaradial symmetry is not homologous to that of echinoderms. After all, this is the single character uniting the two. 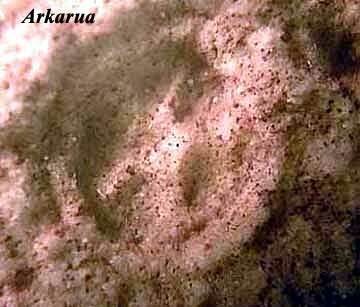 Arkarua is therefore not here accepted as a deuterostome, and is more likely a cnidarian-grade animal or possibly even an alga. Images: Arkarua from the website of Prof. Giuseppe L. Pesce, Università dell'Aquila. Xenoturbella is an odd little organism. We can't say that it has a face only a mother could love, because it doesn't have a face. Or a brain. Or appendages. Or even a through gut, just a blind cul-de-sac. Xenoturbella is a completely unassuming little blob that seems to want nothing more in life than to wallow in the mud of the North Sea. For systematists, its extreme simplicity and hence shortage of obvious synapomorphies with any other taxa have made it into something of a nuisance. Generally it has been lumped with the Acoelomorpha, which also lack a through gut. Nevertheless, differences in anatomical structure of most organs made this a very uneasy arrangement. Haszprunar et al. (1991). 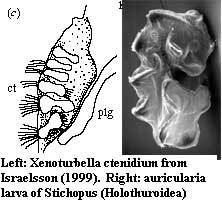 So Xenoturbella was for the most part effectively swept under the rug until 1997, when two studies announced that it was a mollusk. Gee 2003); Bourlat et al. (2003). Not only did molecular analysis place it among bivalves, but bivalve eggs and larvae were found within specimens. It was thus inferred that Xenoturbella began life as a typical bivalve, but over the course of development all features indicative of its origin were lost. The problem was that such a total obliteration was in stark contrast to the apparent normality of the molecular data. Indeed, the Xenoturbella sequences actually nested within the genus Nucula, a basal but fairly unremarkable bivalve - the SSU rDNA sequence was identical to that of N. sulcata. In 2003, Bourlat and co-workers gave an explanation for this paradox -- the sequences came not from Xenoturbella, but from Nucula larvae that it had ingested. Xenoturbella is not a mollusk, but a molluscivore. Bourlat et al. identified another sequence that appeared to come directly from Xenoturbella, as shown by its amplification from specimens with the gut removed. These sequences grouped with the deuterostomes, specifically with the Ambulacraria. Unlike the mollusk hypothesis, this result was not entirely novel. Reisinger had suggested in 1960 that Xenoturbella might be derived from a neotenous deuterostome larva based on features of the nervous system, the enteropneust-like epidermis and the spermatozoa. Haszpruar et al. 1991). Bourlat et al. suggested a position as the sister group of Ambulacraria to be more likely than one within it due to codon usage. For instance, the ATA codon codes for methionine as in most metazoans, rather than isoleucine as in Ambulacraria. The characters shared by Ambulacraria and chordates suggest that Xenoturbella is secondarily simplified, rather than representing the ancestral form for deuterostomes. Such secondary simplification is unusual in a free-living organism. It is more common in parasitic forms. How Xenoturbella managed to lose many of the features its ancestors undoubtedly had is completely unknown. Additional note: Christopher Taylor's discussion of Xenoturbella was sufficiently intriguing that we decided to poke around a bit further. One further objection to ambulacrarian status for Xenoturbella comes from the embryological work of Israelsson 1999). Israelsson, working with rare and difficult material, it should be noted, found that embryos associated with Xenoturbella were of a perfectly normal trochophore type. This is exactly what one might expect of mollusks in general, and of Nucula in particular. However, specimens undergoing transformation at several months of age apparently lose all of the complexity and internal organization which they developed as embryos. See images. Israelsson was not able to obtain free-living larvae at some intermediate stage. Judging from the embryo, they would be indistinguishable from other molluscan larvae. This data, Israelsson argues, clearly shows that Xenoturbella is a degenerate mollusk. Yet it also makes it quite difficult to explain why Xenoturbella develops all these molluscan bells and whistles in the first place. Israelsson's remarks suggested that it might be a good idea to look harder at his images. As shown above in red, there is a curious, unlabelled mass associated with the pleural ganglion. 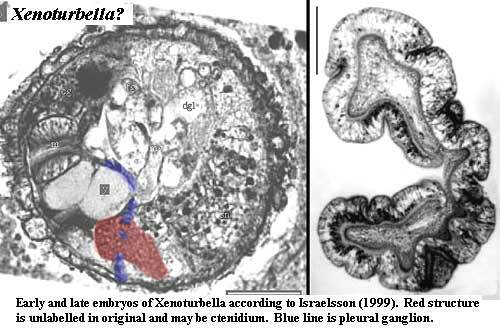 With not too much imagination, it could be mistaken for a smaller version of the late-stage Xenoturbella larva on the right of the image, also from Israelsson (1999). The two images are almost exactly to scale, with scale bar = 500µ in both. So where does this leave us? Granted, this is all a bit of a shot in the dark, but there is a third possibility. Perhaps the unlabelled mass is actually the early developmental stage of Xenoturbella, while the rest is -- just as it appears -- an embryo of Nucula. That is, perhaps Xenoturbella develops as an endoparasite of Nucula embryos. In that case, we would suppose that Xenoturbella injects its own eggs inside the growing embryos of Nucula. The Xenoturbella embryo then consumes the Nucula embryo from within. It emerges into the environment as a very simple planktonic worm, feeds (not necessarilly on Nucula) and grows. Eventually, it captures more Nucula embryos of its own, and continues the cycle. This hypothesis explains much that is otherwise obscure. For example, Xenoturbella looks like a highly simplified parasitic form because, developmentally, it is a highly simplified parasitic form. The non-parasitic adult form is only a bridge between parasitic developmental forms. Free embryonic forms of Xenoturbella are never found because no such embryos exist except inside Nucula embryos. Similarly, larval forms of Xenoturbella are never found because development is direct. Fertile eggs of Nucula are routinely found in the gut of adult Xenoturbella for the very good reason that Xenoturbella cannot reproduce without them. 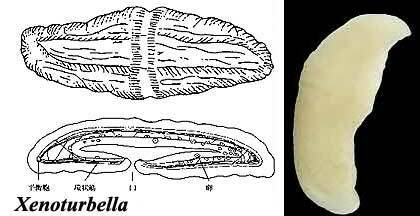 We might conclude, then, that Xenoturbella is neither mollusk nor molluscivore, but an obligate developmental parasite of bivalves. ATW050828. Christopher adds: Another possibility to explain the simplicity of Xenoturbella that might be more likely (though really equally hypothetical) is that it has gone through a size squeeze at some point in its ancestry. In other words, at some point an ancestral deuterostome became really small, probably as a member of the meiofauna, and lost a number of complicated organ systems as a result. Compare what happened to the Kowalevskiidae among the Urochordata loss of endostyle, heart, and spiracles; body form strongly simplified, with very short life cycle). Xenoturbella then once again became bigger, but with a simplified organ system. However, short of actually finding micro-xenoturbellids, it would be very difficult to test this idea. CT050901. Images: Xenoturbella diagram from the University Of Tokyo School of Science. Photo inset from BBC News, 030821. Stichopus larva from Marine Invertebrate Larvae: a Study in Morphological Diversity, by Prof. Thurston Lacalli (Univ. Saskatchewan). All other figures from Israelsson 1999). Links: Clade Ambulacraria - Cladification - Systema Naturae 2000 Taxonomicon entry); Bayesian phylogenetic analysis supports monophyly of ambulacraria and of cyclostomes; Evaluating Hypotheses of Deuterostome Phylogeny and Chordate Evolution with New LSU and SSU Ribosomal DNA Data (two molecular studies supporting the monophyly of Ambulacraria); Folie 1 biochemical study of phylogeny, focusing on Xenoturbella); Pharyngula--Spectacular echinoderms from the Lower Cambrian summary of Shu et al., 2004 from Pharyngula); Ancestral echinoderms from the Chengjiang deposits of China full text of Shu et al., 2002). A phylogeny of the hemichordates based on morphological characters Cameron, 2005 -- really nice paper, but restricted to living taxa); Animal phylogeny and the ancestry of bilaterians- inferences from ... full text of Peterson & Eernisse, 2001). ATW060104.